• November Salvages a Gain. U.S. stocks advanced last week, with the S&P 500 posting its strongest weekly gain since December 2011, following dovish comments from the Federal Reserve and optimism ahead of a key Saturday trade meeting between President Trump and China’s President Xi Jinping. The advance erased earlier November losses to end the month in the black (+2.04%). • Weekly Performance. For the week, the S&P 500 advanced 4.91%, the Dow Industrials rallied 5.16% and the tech-heavy Nasdaq Composite surged 5.66%. • Chicago Business Activity Jumps. The Chicago MNI Business Activity Index surprised higher in November, unexpectedly rising to 66.4 after falling to 58.4 the month prior, its first increase in four months. Economists’ had forecast a decline to 58.0. • Cyclical Stocks Gain the Most. All 11 major sector groups posted solid gains last week, led by Consumer Discretionary (+6.55%), Technology (+6.14%) and Healthcare (+6.01%). Materials (+2.56%), Utilities (+2.79%) and Real Estate (+2.79%) rose the least. • Treasury Bonds Rise with Stocks. Treasurys rallied last week, sending the yield on benchmark 10-year notes down 5.2 basis points to end the month at 2.99%. The U.S. Dollar Index strengthened by 0.37% to finish the week at 97.272. Oil prices briefly fell below $50/barrel on Friday, trimming a weekly gain to 1.01%. Despite the gain, U.S. oil prices closed out November down 33% from its 2018 high of $76.10 on October 3. Strong global production is contributing to a world-wide oil glut. Friday, December 7: Nonfarm Payrolls, Wholesale Inventories, Consumer Credit. The recent volatility in equity markets has not rattled consumers up to this point. 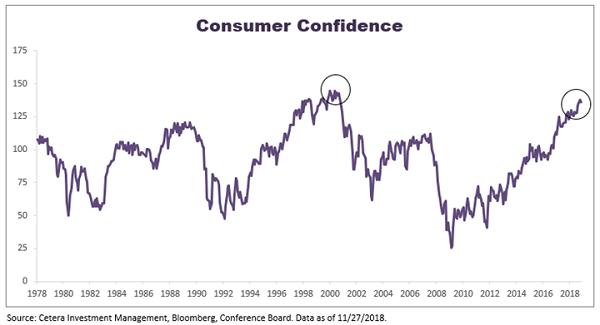 Consumer confidence remains high at a level of 135.7 in November according to the Conference Board. That is slightly below the 18-year high of 137.9 in October, but still highly elevated compared to history. Consumer activity has been strong in 2018, with strong tailwinds from tax reform, a strong economy, and a healthy labor market. The sharp drop in oil prices is bringing down the price of gasoline and that is helping keep confidence at a high level. Based on the recent strength in consumer activity and elevated consumer confidence, we anticipate a strong holiday shopping season, which in turn may offer support to the retail and consumer discretionary sectors. The early numbers are encouraging - Cyber Monday sales climbed to a record breaking $7.9 billion last week, more than 19% higher than 2017.